On the 30th October German TV Channel ARTE.TV, will showreel a piece they have put together following the The Spanish Masters Athlete in the build up to Malaga wand will show his passion for athletics on October 30th at 19.40h. The subject of the report is “Masters/Seniors in high level competition”. Excerpt from the sites coverage below. 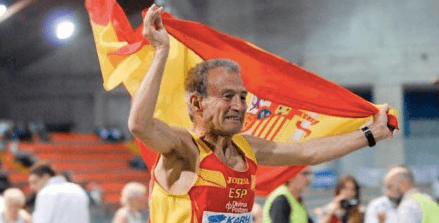 Manuel Alonso Domingo is 82 years old – and probably fitter than many mid-twenties. He is one of the world’s best runners in his age group: European champion, world champion – 800 meters he runs in under 3 minutes. Record. “Sport is my life,” says the Spaniard. Will he be able to defend his title at the Senior World Athletics Championships in Malaga? At the World Masters Athletics, the Senior Athletics World Championships, Alonso faces tough athletes from around the world. 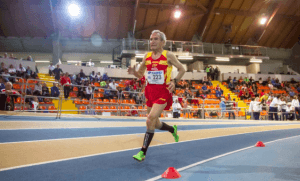 Because more and more seniors are pursuing competitive sports – a Europe-wide development: At the first Senior World Championships 2013 in Rio de Janeiro, 4,000 athletes were at the start. There are already around 8,000 competitors this year in Malaga: runners, high or wide jumpers, throwers. The oldest participant comes from India and is 102 years old. 60 is the new 40 – 80 is probably the new 60th Many seniors are longer healthy and fit than before. Manuel Alonso Domingo has to have regular check-ups with the doctor – stress tests to see if the heart and lungs are making the effort. “If I could not run anymore, that would be a disaster. The sport keeps me alive “.